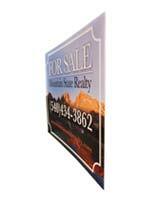 In a trade show setting, Rigid Graphics are typically used for counter, header, or insert graphics. They are also used for Wing Panels on Exhibit Line Displays. Outside of trade shows, Rigid Graphics are used in a myriad of places. From small real estate signs, to large store front entrance way signs rigid graphics are an economic option compared to much more expensive painted signs or channel lettering. Pricing varies greatly depending on material so contact your local vendor for a quote.